Hello fellow orchid enthusiasts! Here is the launch into the second newsletter for me. I love February. Here in Napa, California the grape vines are still sleeping but the mustard is blooming painting the landscape in brilliant yellows and greens. Soon the ornamental plums will burst forth with their fuzzy pink blossoms and their promise of spring. It is just heaven to look at such beauty. February is a special month in many ways, not the least which is Valentine’s Day on February 14th. I love Valentine’s Day. It is not just the day when we celebrate romantic love but the day we celebrate LOVE in general. Agape and Eros! In the immortal words of the Beatles, “LOVE IS ALL THERE IS”. February is special for Valentine’s Day especially for Casa Carneros (my winery) and for the Pacific Orchid Exposition. The Casa Carneros logo is 3 hearts which also in the family crest of my surname Moravec (Czech). It is displayed on the label of all our wines. Of course, our wine is a popular gift, for this time of year where hearts are everywhere. There is nothing like a lovely dinner and a great wine with hearts all over the label for celebrating Valentine’s. Looking for wine for Valentines or after? Check out the Casa Carneros website at www.casacarneros.com Cheers! Ah so sorry, shipments only in the United States and limited to some of those states. February is special for the time of the Pacific Orchid Exposition is held in San Francisco at the end of February. There Casa Carneros will pour wine for the Thursday Benefit Night. Check out the details in my last (first) newsletter that I sent out January 29, 2008. Come join us if you possibly can. I promise it is an event worth attending. I have been working on a newsletter for February on “Easy Orchids”. But it has a way to go yet and I wanted to drop you all a note prior to Valentine’s Day. So look for the “Easy Orchids” newsletter next time. If I don’t do anything else with this newsletter with respect to Valentine’s Day, let me make a suggestion. If you are considering giving flowers of some sort to you Valentine or other loved ones let me encourage you to Give an Orchid!!! Orchids are indeed the Gems of Nature. The family of orchids, one of the most highly evolved of the entire plant kingdom, comprises over 25,000 individual species. Orchids in general last longer than cut flowers and in some cases the flowers can grace your home or office for over 3 months. They come in a wide variety of shapes and colors, there is something for every taste and preference and many of them are not just beautiful but fragrant. Exotic beauties of the plant kingdom, they are eager to help you celebrate this day of love if you just invite them in to do so. I do have some favorite commercial growers for orchids of various kinds but I will leave that list to another time. As you can tell, I have lots of ideas for this newsletter. Ideas that I hope will inform, intrigue and support your journey with these marvelous plants. But it all takes time so you will have to stay tuned to see how they all evolve and how the journey goes. Happy Valentine’s Day. Please accept my apologies to the places and cultures where it is not celebrated as such. However, I have it on good authority that every culture on the planet celebrates LOVE and PLANTS in some fashion. 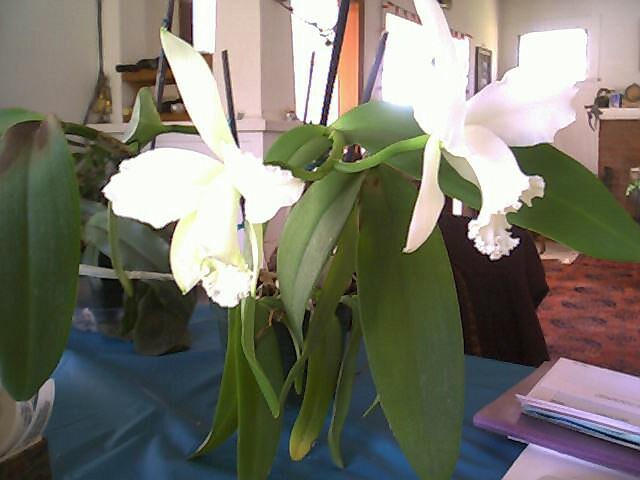 This is a picture of a lovely, fragrant Laelia-Cattleya that I received from a friend 18 years ago. She had almost killed it. I rescued it and brought it back to health and have rebloomed it many, many times. I have also divided it to make more of this lovely creature.